Buona Sera. We took it easy today. Had breakfast with some of our tour-mates and said good-bye as they headed home. We visited the Spanish Steps, which were built by the French, but the Spanish Embassy is at the bottom. We walked along Via Condotti, which is the "Rodeo Drive" of Rome. Same shops but fun to see in these ancient buildings along ancient streets with shops, and restaurants sprinkled about. 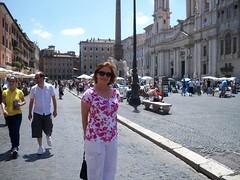 Then, we went to Piazza Navona. According to our tour guide, Debi, this is THE place to "see and be seen" for both tourists and Romans. don't know why she said that. The piazza is the exact shape of the original Roman "agones," which were 1st century athletic competitions. Ruins of the original stadium can be seen from outside the piazza. Gian Lorenzo Bernini's Four Rivers Fountain (of Angels and Demons fame) is at one end of the piazza. Really intersting fountain to contemplate. Artists can be found selling their work in the center of the piazza, and there were also a couple musical groups performing. The piazza has many restaurants with outdoor seating. Tre Scalini restaurant is where Sophia Loren recommends the Tartufo, chocolate-chocolate fudge ice cream with a surprise inside. Very nice place to relax with a glass of wine and have lunch or dinner. A little more shopping along the Via Nazionale and then back to the hotel. Tomorrow, we are going back to the Vatican area to shop a little, have lunch and then visit the Borghese Gallery. Our trip is winding down.